Today there is again a software update. 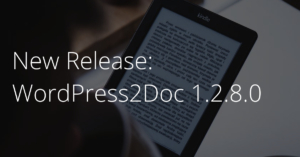 Since yesterday evening the new version 1.2.7.0 of the WordPress2Doc Tool is available for download. In addition to two bugfixes, further translations have been introduced. Thanks a lot to the community support! If you have forgot (or not even have known yet), for what the WordPress2Doc-Tool can be used, the following brief summary is given. 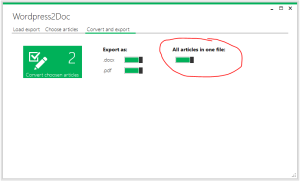 Using WordPress2Doc, you can save as many articles and pages of a WordPress blog as a Word document (.docx) and / or as a PDF file. It is possible to select whether all articles should be created in one document or whether a new document should be created for each article. This makes it easy to back up, print, and prepare blog articles for further use. Today I would like to present you again a small tool from “own production”. The tool I’m talking about is called MTU-Optimizer. The name already gives an indication of what the tool can do for you: It determines the MTU (Maximum Transmission Unit) and can set it for any network card. Like most of my tools, the MTU Optimizer is programmed in C# and designed as portable application. (This means: It does not require any installation and can be started, for example, from a USB flash drive.) 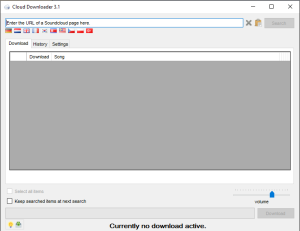 The download link to the tool can be found at the end of this article. Beforehand, however, I would like to briefly discuss the capabilities of the tool. Therefore we should first have a look at what the MTU is all about. Most readers of this blog who are on the road to online marketing should have heard about Digistore24. With over 50,000 members and more than 3,500 products, it is probably the largest German marketplace for digital products. Unfortunately with so many products their product catalog lost the clearness in some way. 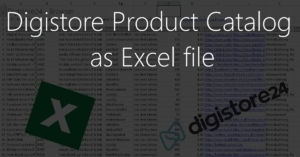 Although Digistore24 offers detailed information on each product, such as reward, churn rate, average reward per cart, etc., these criteria can not be filtered in the product list. As an affiliate, who is looking for a product which fits the own needs, one is left stranded. The weekend is almost over and I was diligent. So there is a new update for the Cloud Downloader. In addition to some bug fixes, there are also one, two small new features this time. So it’s not a pure bugfix release. If you like the animations, but don’t like cats, you can switch to dogs, sloths, donkeys, fails or wins.